KENNEDY SPACE CENTER, FL – SpaceX blasted the “largest and most complicated communications satellite ever built to orbit” for London based Inmarset at twilight this evening, May 15, from NASA’s Kennedy Space Center aboard an expendable Falcon 9 rocket. In fact the Inmarsat-5 F4 satellite is so powerful that it has the potential to reach “hundreds of millions of customers” the Inmarsat CEO Rupert Pierce told Universe Today in a post launch interview at the Kennedy Space Center. The newly built 229-foot-tall (70-meter) SpaceX Falcon 9 successfully delivered the huge 6100 kg Inmarsat-5 F4 satellite to a Geostationary Transfer Orbit (GTO) under brilliant blue twilight skies from the Florida Space Coast. The 7 meter long satellite was deployed approximately 32 minutes after launch when it will come under the command of the Boeing and Inmarsat satellite operations teams based at the Boeing facility in El Segundo. The new satellite will join 3 others already in orbit. And SpaceX is on an absolutely torrid launch pace. Monday’s liftoff comes just 2 weeks after the last successful SpaceX Falcon 9 liftoff on May 1 of the super secret NROL-76 payload for the National Reconnaissance Office, or NRO – as I reported here. KENNEDY SPACE CENTER, FL – The opening volley of March Launch Madness started brilliantly as showcased by stunning imagery of the inaugural nighttime launch of a SpaceX Falcon 9 off historic pad 39A under moonlit skies along the Florida Space Coast on Thursday, March 15. The 229 foot tall Falcon 9 rocket thundered to life at 2:00 a.m. EDT Thursday, March 16 on a commercial liftoff from Launch Complex 39A on NASA’s Kennedy Space Center and successfully delivered the high capacity EchoStar XXIII TV broadcast satellite to geosynchronous orbit for Brazil. Check out the expanding spectacular gallery of launch photos and videos gathered from my space journalist colleagues, myself and spectators ringing the space coast. Besides being the first night launch of a Falcon 9 from pad 39A, the mission also goes down as the first fully commercial launch from pad 39A. Overall the EchoStar XXIII launch counts as only the second Falcon 9 ever to blast off from pad 39A. The inaugural Falcon 9 blastoff successfully took place last month on Feb. 19 on a contracted cargo resupply mission for NASA that delivered over 2.7 tons of science experiments, crew supplies and research gear to the International Space Station (ISS) on the SpaceX CRS-10 Dragon spaceship – as I reported here. SpaceX’s billionaire CEO Elon Musk leased historic pad 39A from NASA back in April 2014 for launches of the firms Falcon 9 and Falcon Heavy carrying both robotic vehicles as well as humans on missions to low Earth orbit, the Moon and ultimately the Red Planet. After a short delay due to wind issues, the Falcon 9’s nine Merlin 1D first stage engines ignited at 2:00 a.m. EDT March 16, generating 1.7 million pounds of liftoff thrust to propel the commercial EchoStar 23 telecommunications satellite off pad 39A and on its way to a Geostationary Transfer Orbit (GTO) for EchoStar Corporation. The satellite was deployed approximately 34 minutes after launch. If all goes well, March features a triple header of launches with launch competitor and arch rival United Launch Alliance (ULA) planning a duo of nighttime blastoffs from their Delta and Atlas rocket families. With Falcon away, the launch dates have been rescheduled for Saturday, March 18 and Friday, March 24 respectively. Indeed the potential for a grand slam of launches also exists with another Falcon 9 blastoff at the very end of this month – if all goes well. But first we have to get through the Delta and Atlas launches and deal with finicky Florida weather. SpaceX announced that this was the last launch of an expendable Falcon 9. The post midnight spectacle thrilled spectators who braved the wee hours this morning and were richly rewarded with a rousing rush as the 229 foot tall Falcon 9 rocket thundered to life at 2:00 a.m. EDT Thursday, March 16 from historic Launch Complex 39A on NASA’s Kennedy Space Center and sped to orbit. Rising on the power of 1.7 million pounds of liftoff thrust generated by nine Marlin 1D first stage engines, the two stage Falcon 9 rocket successfully delivered the commercial EchoStar 23 telecommunications satellite to a Geostationary Transfer Orbit (GTO) for EchoStar Corporation. Thus began March Launch Madness !! If all goes well, March features a triple header of launches with launch competitor and arch rival United Launch Alliance (ULA) planning a duo of nighttime blastoffs from their Delta and Atlas rocket families. The exact dates are in flux due to the earlier postponement of the SpaceX Falcon 9. They have been rescheduled for March 18 and 24 respectively. EchoStar 23 will be stationed over Brazil for direct to home television broadcasts and high speed voice, video and data communications to millions of customers for EchoStar. It was designed and built by Space Systems Loral (SSL). “EchoStar XXIII is a highly flexible, Ku-band broadcast satellite services (BSS) satellite with four main reflectors and multiple sub-reflectors supporting multiple mission profiles,” according to a description from EchoStar Corporation. EchoStar XXIII will initially be deployed in geosynchronous orbit at 45° West. The Satellite End of Life (EOL) Power is 20 kilowatts (kW). The entire launch sequence was broadcast live on a SpaceX hosted webcast that began about 20 minutes before the revised liftoff time of 2:00 a.m. from the prelaunch countdown, blastoff and continued through the dramatic separation of the EchoStar 23 private payload from the second stage. The EchoStar 23 launch counts as only the second Falcon 9 ever to blast off from pad 39A. The inaugural Falcon 9 blastoff successfully took place last month on Feb. 19, as I reported here. However unlike most recent SpaceX missions, the legless Falcon 9 first stage will not be recovered via a pinpoint propulsive landing either on land or on a barge at sea. Because of the satellite delivery to GTO, there are insufficient fuel reserves to carry out the booster landing. “SpaceX will not attempt to land Falcon 9’s first stage after launch due to mission requirements,” officials said. Therefore the first stage is not outfitted with either landing legs or grid fins to maneuver it back to a touchdown. PORT CANAVERAL, FL – The spent SpaceX Falcon 9 first stage booster that sped to space and back and landed safely at sea, ‘lifted off’ for a second time so to speak after CEO Elon Musk’s “Baby Made it Home” to her home port around lunchtime on June 2 – as I witnessed and reported here for Universe Today. “Yay, baby made it home,” SpaceX CEO and billionaire founder Elon Musk exuberantly tweeted with a link to my port arrival story and photos showing the tilted booster radiantly floating atop the droneship landing platform. Photos above and below from myself and colleagues capture Falcon’s 2nd ‘lift off’ – this time at dusk on June 2, via crane power as workers hoisted it off its ocean landing platform – with an American flag flying proudly below – onto a ground based work platform to carry out initial processing. The booster triumphantly entered the waterway into Port Canaveral, Fl by way of the ocean mouth at Jetty Park pier at about 11: 45 a.m. on June 2 under clear blue skies. It continued sailing serenely along the Port Canaveral channel – towed behind the Elsbeth III tugboat – making a picture perfect tour for lucky spectators for another 30 minutes or so until docking at the SpaceX ground processing facility. All in all it was quite appropriately an ‘otherworldly’ scene reminiscent of a great scifi movie. Watch this video from my photojournalist colleague Jeff Seibert. The beaming 156-foot-tall Falcon 9 booster had propulsively landed six days earlier atop the specially designed SpaceX ‘droneship’ named “Of Course I Still Love You” or “OCISLY” less than 9 minutes after the spectacular May 27 blastoff. The Falcon 9 was leaning some 5 degrees or so on the droneship upon which it had landed on May 27 while it was stationed approximately 420 miles (680 kilometers) off shore and east of Cape Canaveral, Florida, surrounded by the vastness of the Atlantic Ocean. After docking, SpaceX workers then spent the next few hours carefully maneuvering and attaching a pyramidal shaped metal hoisting cap by crane to the top of the 15 story tall first stage – as it was firmly secured to the deck of the droneship via multiple tie downs. It was a delicately choreographed and cautiously carried out operation, complicated by the fact that this used, returned booster was tilted. The prior two sea landed Falcon 9 boosters landed perfectly upright in April and May. Indeed a pair of technicians had to ride a cherry picker lift to the very top to help fasten the cap securely in place as it was slowly lowered in the late afternoon. Workers then spent several more hours undoing and removing the tiedowns to the droneship deck, one by one. Finally and with no fanfare the ‘GO’ command was suddenly given. At dusk, Falcons 2nd ‘ascent’ began at around 8 p.m. The small group of us patiently watching and waiting all day from across the channel had no warning or advance notice. My guestimate is Falcon rose perhaps 30 to 40 feet. It was craned over to the right and lowered onto the waiting ground based retention work platform. Altogether the whole movement took some 10 minutes. The SpaceX Falcon 9 began its rapid journey to space and back roaring to life at 5:39 p.m. EDT last Friday, May 27, from Space Launch Complex-40 at Cape Canaveral Air Force Station, FL, ascending into sky blue sunshine state skies. The Falcon 9 was carrying the Thaicom-8 telecommunications satellite to orbit as its primary goal for the commercial launch from a paying customer. It roared to life with 1.5 million pounds of thrust from the first stage Merlin 1 D engines and successfully propelled the 7000 pound (3,100 kilograms) commercial Thai communications satellite to a Geostationary Transfer Orbit (GTO). Landing on the droneship was a secondary goal of SpaceX’s visionary CEO and founder Elon Musk. It was leaning due to the high speed reentry and a touchdown landing speed near the maximum sustainable by the design. “Rocket landing speed was close to design max & used up contingency crush core, hence back & forth motion,” tweeted SpaceX CEO Elon Musk. That tilting added significant extra technical efforts by the SpaceX workers to stabilize it at sea and bring it back safely and not tip over calamitously during the six day long sea voyage back to home port. 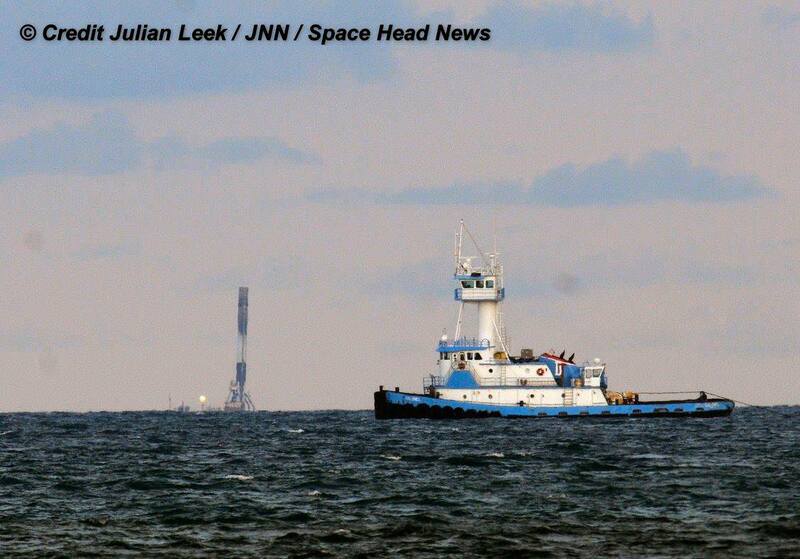 ““Rocket back at port after careful ocean transit. Leaning back due to crush core being used up in landing legs,” SpaceX explained. What is the crush core? “Crush core is aluminum honeycomb for energy absorption in the telescoping actuator. Easy to replace (if Falcon makes it back to port),” Musk tweeted during the voyage home. The landing leg design follows up and improves upon on what was used and learned from NASA’s Apollo lunar landers in the 1960s and 1970s. Check out this graphic tweeted by SpaceX. Technicians started removing the quartet of landing legs on Friday. I observed the first one being detached late Friday, June 3. 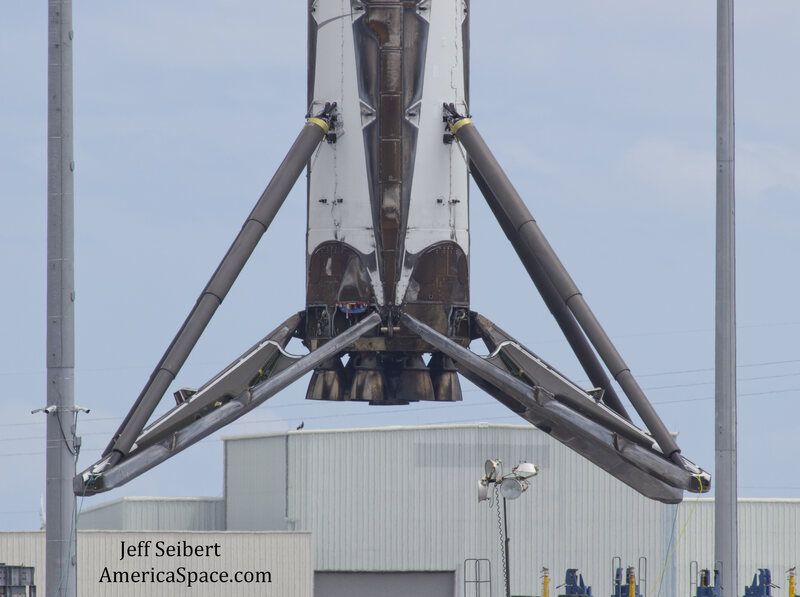 The booster was rotated horizontally after all the legs were removed and transported back to the SpaceX processing hangar at the Kennedy Space Center at Launch Complex 39A. The three prior landed boosters were all moved to 39 A for thorough inspection, analysis and engine testing. One will be refurbished and recycled for reuse. Later this year, SpaceX hopes to relaunch one of the recovered first stage boosters. Musk hopes to launch humans to Mars by the mid-2020s. The recovered SpaceX first stage booster that nailed a spectacular middle-of-the-night touchdown at sea last week sailed back to Port Canaveral, Florida, late Monday and was transferred by crane on Tuesday from the drone ship to land – as seen in an amazing time-lapse video and photos, shown above and below and obtained by Universe Today. The exquisite up close time-lapse sequence shows technicians carefully hoisting the 15-story-tall spent booster from the drone ship barge onto a work pedestal on land some 12 hours after arriving back in port. The time-lapse imagery (below) of the booster’s removal from the drone ship was captured by my space photographer friend Jeff Seibert on Tuesday, May 10. Towards the end of the video there is a rather humorous view of the technicians climbing in unison to the bottom of the hoisted Falcon. “I particularly like the choreographed ascent by the crew to the base of the Falcon 9 near the end of the move video,” Seibert told Universe Today. The move took place from 11:55 AM until 12:05 PM, Seibert said. The booster was towed into the space coast port around 11 p.m. Monday night, as seen in further up close images captured by my space photographer friend Julian Leek. Leek also managed to capture a stunningly unique view of the rocket floating atop the barge when it was still out at sea and some 5 miles off shore waiting to enter the port at a safe time after most of the cruise ships had departed – as I reported earlier here. The 156 foot tall booster safely soft landed on the drone ship named “Of Course I Still Love You” or “OCISLY” barely nine minutes after liftoff of the SpaceX Falcon 9 last week on a mission to deliver the Japanese JCSAT-14 telecom satellite to a Geostationary Transfer Orbit (GTO). The first stage then carried out a propulsive soft landing on the ocean going platform located some 400 miles off the east coast of Florida. The first rocket was flying faster and at a higher altitude at the time of seperatoin from the second stage and thus was much more difficult to slow down and maneuver back to the ocean based platform. Thus SpaceX officials and CEO Elon Musk had been openly doubtful of a successful outcome for this landing attempt. The landing counts as another stunning success for Elon Musk’s vision of radically slashing the cost of sending rocket to space by recovering the boosters and eventually reusing them. The next step is to defuel the booster and remove the landing legs. Thereafter it will be tilted and lowered horizontally and then be placed onto a multi-wheeled transport for shipment back to SpaceX launch facilities at Cape Canaveral for refurbishment, exhaustive engine and structural testing. The newly recovered first stage will join a fleet of two others recovered last December and in April. “May need to increase size of rocket storage hangar,” tweeted Musk. If all goes well the recovered booster will eventually be reflown. The next SpaceX commercial launch is tentatively slated for the late May/early June timeframe.